If Sharp's new product is anything to go by, then small, cute robots might be taking over the duties of your smartphone. The Sharp RoBoHoN is a small robot that can move around while acting as both your smartphone as well as your digital assistant. 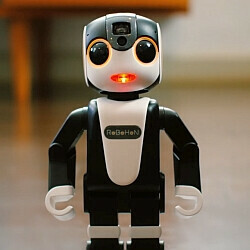 The RoBoHoN is designed to react to your commands and has an always-on microphone that will constantly look out for orders to fulfill. Sharp's robot can do things such as set alarms, schedule reminders, read and reply to emails, or place phone calls, much like a digital assistant feature would work on a smartphone. But thanks to its bipedal nature, the RoBoHoN can also move around a bit, which is a thing that no smartphone can do. Sharp's robot also has everything that you can find on a smartphone. It comes with a Qualcomm Snapdragon 400 SoC, has 3G, LTE, and Wi-Fi, a camera, and even a built-in projector that can be extremely useful for watching movies on your bedroom wall. For when voice commands can't get the job done, the Sharp RoBoHoN also comes with a tiny 2-inch display with a resolution of 240 by 320 pixels. Speaking of droids, Sharp strangely doesn't mention the OS that the RoBoHoN runs on. However, based on the UI of the tiny display, we're inclined to believe that the robot is based on Android. The Sharp RoBoHon will hit Japan at some point in the first half of 2016 at a currently undisclosed price. No word yet on global availability. Why do you hate everything Japanese? Seriously, if this is about WW2 like some users suggest, then you need to grow up. Lol that's awesome actually. I would never use it in this form. But say if Sharp partnered with Hasbro and they made a transformers version or a ironman version, I might use it. He can be like a mini robot version of Jarvis. Or a BB Star Wars version that rolls around like the current toy would be so awesome. Lol Actually that would probably sell. A BB version of this with Jarvis voice. Bumble bee or Sphero BB-8 version of this would sell like hot cakes. Maybe Gundam version too or Astro boy. Putting that to your head to answer a call looks no sillier than the old N-Gage. May as well be a robot, we've got huge phablets the size of frying pans anyway.